Sometimes sequels just aren’t called for. 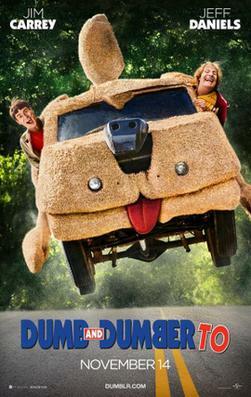 In the sequel to the 1994 comedy classic, Dumb and Dumber, we follow Lloyd and Harry once again go on a trip across America – this time in search for the daughter of Harry, who has been adopted. There’s some added emotional weight added to the film, seeing as Harry desperately needs to find a kidney-donor. That’s the overall frame for this feature length journey, and it’s complete with fun nods to the original film like specific dream sequences ending in a certain way, and the vehicle on the film’s poster. Jim Carrey and Jeff Daniels are, of course, back – but while they both act out the comedy extremely well, they aren’t given a lot to deal with. I just don’t feel that a huge chunk of this movie is funny at all – primarily around the time of the point of no return in the third act. That’s not to say that it’s not funny at all, because of course Daniels and Carrey are funny – but most of the jokes are not really that memorable – and the film isn’t instantly quotable. The thing is that the film borrows a lot of the plotpoints and quotes from the original film – and thus takes some fanservice and turns them into wasted moments of material that feels copypasted. Sadly, I also felt that the parts of the plot that weren’t ‘copypasted’ were predictable. Daniels and Carrey are the real highlights of the film, for there’s nothing else to be excited about. The plot feels similar to the original, the jokes feel similar to the ones in the original and the sidecharacters aren’t that exciting. While I didn’t hate this movie, I feel that I have to add that the people next to me were so disappointed that they left the film after 30 minutes – and I’m sure they weren’t the only ones wishing they were somewhere else… And that’s sad, ’cause it’ll never get old seeing Jeff Daniels and Jim Carrey having fun together. Overall Score: 4.7 out of 10. Though not completely without laughs or fanservice, this film remains nothing more than yet another comedy classic sequel – and not a single one of them are very good. I loved the original, but this one lost its magic – perhaps this was a missed opportunity.